Panasonic TX-L32E5B review | What Hi-Fi? The first thing we notice when turning this Panasonic TX-L32E5B TV on is that the picture has a warm and yellowy hue to it, a characteristic usually spotted on Panasonic’s plasma TVs. A flick through the viewing modes to mitigate this doesn’t help much either, with True Cinema making the picture too cool and Dynamic seeing it get brash and overexposed. The colour tint control helps a little, though, even if the warm hue does linger a little. It’s not too major a gripe, though, as the warm palette gives the TX-L32E5 an inviting look, whether you’re watching Blu-rays, upscaled DVDs or standard-definition TV. It doesn’t play havoc with the detail levels either; the TX-L32E5 benefits from brilliantly balanced contrast. Blacks are sufficiently inky, while whites shine without being harsh or glaring. Skin tones are naturally textured too, although they do have a tendency to look a bit bright and yellowy, given this set’s colour bias. The L32E5 doesn’t look too dynamic next to Samsung's UE32ES5500 and UE32ES6800 (which have bold colours and exciting sharp contrasts) or the Sony KDL-32HX753 (which has a more neutral balance and has a clearer and more natural picture overall). The TX-L32E5 sits in between the two brands: the edges aren’t as sharply defined, but it lends the picture a soft and smooth touch which, coupled with the warm tone, makes it gentle and pleasing to watch. Low-level detail is fine, but in overall subtlety this set can’t quite match the efforts of its sibling, the Panasonic TX-L32ET5B. There’s no 3D on this set, but you can watch any amount of HD content, not just through the Freeview HD tuner but also via a host of internet services. HD videos on YouTube can look fuzzy and patchy on even the most competent screens, but we played the HD trailer for Pixar’s Brave and it looked fantastic: the picture was crisp and relatively noise-free, with excellent definition. The menus and interface might not look as exciting as some rival offerings, but they are quick and easy to use with the standard remote, although there’s no picture-in-picture view when scrolling through the programme guide. Moving to the audio side of things, you can choose between two modes: music or speech. No flatscreen we’ve heard sounds great, and this one is no exception, getting thin and bright when the volume is high. ‘Speech’ mode drags the midrange forward to the point that dialogue can sound brittle, which is why we prefer to leave it on ‘Music’ for its rounded quality and softer treble. 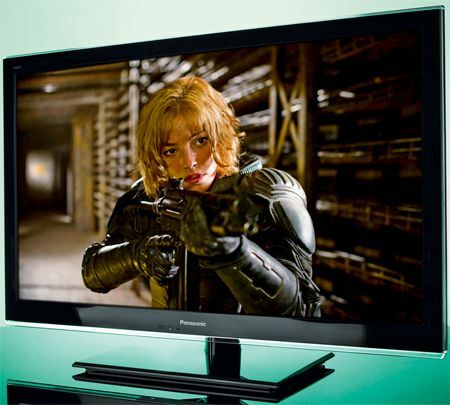 Panasonic TX-L32E5B: VerdictThe TX-L32E5 faces some tough competition from similarly priced TVs. The Samsung ES5500 (also £400) has an altogether different character and a few more frills, such as 3D. Nevertheless, forego the 3D capability and you’ve got an attractively priced TV, with decent quality picture, that will invite you to keep watching.